Right now, the Metropolitan Police is deciding whether to roll out live facial recognition PERMANENTLY on our streets. Police claim the public supports facial recognition surveillance – we think they’re wrong. Don’t miss your chance to tell the police what YOU think – follow the link below to contact the police and tell them what you really think. Despite the evidence that live facial recognition cameras pose a threat to our privacy, freedom of expression, and right of association, the Metropolitan Police are continuing to use this authoritarian technology in public spaces. 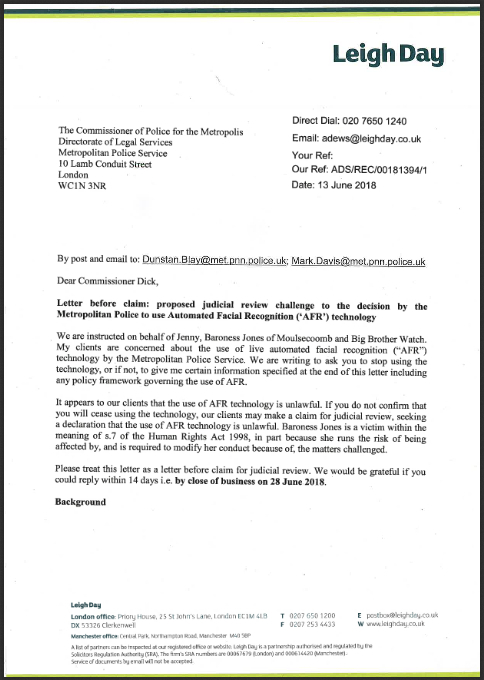 Together with Baroness Jenny Jones we’ve written to the Metropolitan Police and the Home Secretary to demand an immediate end to the police’s use of live facial recognition. This dangerous Orwellian surveillance tool has no place on our streets and if the police don’t stop using it – we will take them to court. However, we can’t do this without your help. Please support the cause by donating to the CrowdJustice fundraiser today. Thank you! 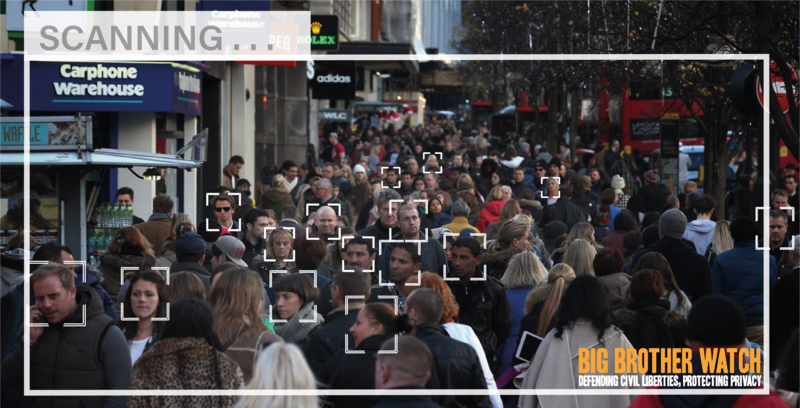 If you or someone you know has been affected by live facial recognition, let us know by sending an email to info@bigbrotherwatch.org.uk. 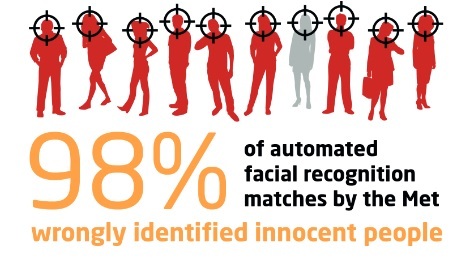 What is automated facial recognition? It’s a relatively new technology, in which facial recognition-linked cameras scan crowds and public spaces in attempt to identify people in real-time, by matching faces against a database. The face of each and every person passing by an automated facial recognition camera will be scanned and analysed, effectively subjecting everyone within view to a covert biometric identity check. How have police been using automated facial recognition? Leicestershire Police, the Metropolitan Police and South Wales Police have used the technology at public events. Police have used automated facial recognition to identify and monitor petty criminals, individuals with mental health issues and peaceful protesters. How does automated facial recognition affect our rights and freedoms? Facial recognition cameras are biometric checkpoints – much like DNA or fingerprint checkpoints. 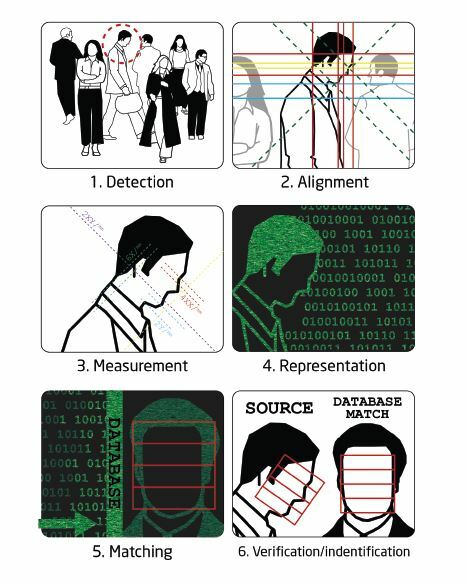 They biometrically assess the identities of passers-by, turning us into walking ID cards. Although the use of the technology with CCTV poses a serious threat to the right to individual privacy and freedom of expression, the police are currently using facial recognition without any legal basis or parliamentary scrutiny. There is also a risk that the technology could have discriminatory impact. Multiple studies have found that facial recognition technology inherits racial and gender biases that disproportionately misidentify people of colour and women. 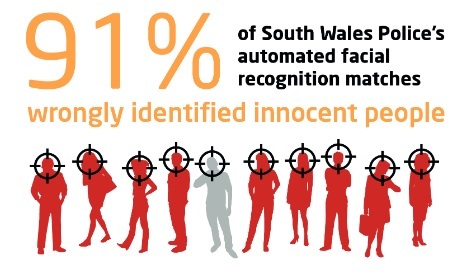 Our report reveals that UK police’s facial recognition ‘matches’ are almost entirely inaccurate, and some people are being stopped and asked to produce their ID to prove their innocence. Police have stored images of thousands of innocent people wrongly identified by the technology, creating a biometric database of innocent people – without their knowledge. Why is the retention of innocent people’s images an issue? When someone is arrested and taken into custody the police the police will take photographs of a suspect’s face. However, unlike fingerprints and DNA an individual’s custody image is not automatically deleted – it can be shared among police forces and used for biometric databases. Being arrested does not make you guilty of a crime. If you want to know more about the retention of innocent people’s custody images click here. Using a series of Freedom of Information requests Big Brother Watch uncovered the full extent of automated facial recognition by UK police forces. You can see all responses we received from Metropolitan Police, South Wales Police and other forces around the country HERE. 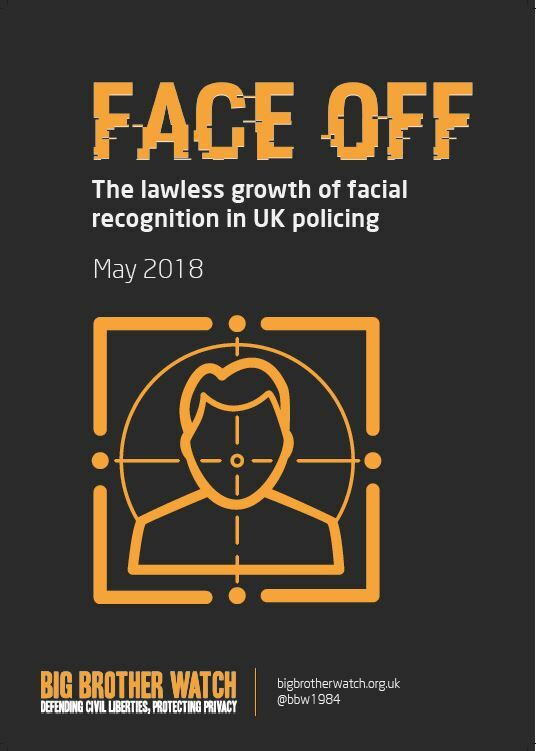 In addition to these findings, our report “Face Off: the lawless growth of facial recognition in UK policing” gives the full results of our investigation, an analysis of the legal and human rights implications, and includes guest contributions from allies worldwide warning about the impact of facial recognition including the American Civil Liberties Union, the Electronic Frontier Foundation, Georgetown Law, and the Race Equality Foundation. 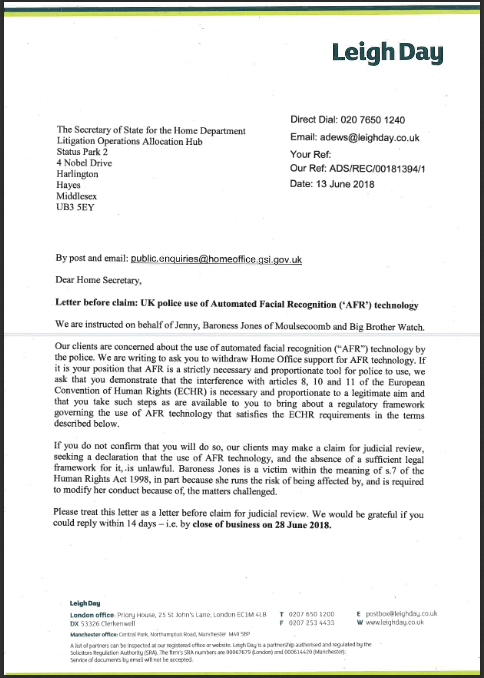 Together with Baroness Jenny Jones, we sent pre-action letters to the Metropolitan Police and the Home Secretary on 13th June 2018, below, to demand an immediate end to the police’s use of live facial recognition. On 25th July 2018 we issued our claim in the High Court. This dangerous Orwellian surveillance tool has no place on our streets and if the police don’t stop using it – we will take them to court. We are crowdfunding for our legal fees via CrowdJustice. Over 250 people have already supported our challenge, and you can join them HERE.